Patellofemoral Syndrome – Putting a Cap on Pain | Podiatry Associates, P.C. The patella, commonly referred to as the kneecap, has received the dubious honor of being the bone most often associated with mafia threats. If you experience pain there, however, you know just how persuasive those threats can be. Patellofemoral syndrome (PFS) is a catch-all term for pain that occurs in front of the knee, although it can be accompanied by other symptoms. In some cases, physical therapy can be an effective tool in relieving knee pain and making you the boss of your condition. Patellofemoral syndrome can have several different sources, but it is often caused by a wearing down or softening of the cartilage beneath the kneecap. This can be the result of a number of factors, the list including overuse, excess weight, injury, or the kneecap not being properly aligned. Athletes, teenagers, and manual workers are common sufferers of knee pain for these reasons. Pain is the main symptom of the syndrome, naturally, but it tends to become more intense when bending the knee. Sitting, squatting, jumping, or traveling down stairs can all make discomfort worse. 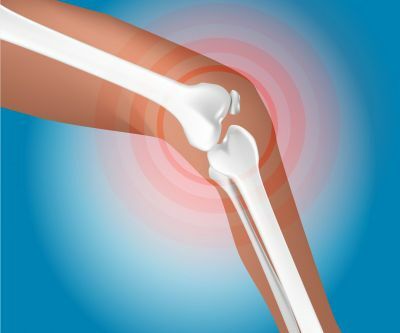 Additional symptoms may include a grinding or popping feeling when moving the knee, as well as the knee suddenly buckling or giving way beneath your body weight now and then. A full knee examination and a medical history will often be performed to rule out certain forms of damage and narrow in on the exact causes of the pain. An X-ray or magnetic resonance imaging (MRI) scan may also be ordered. The pain of patellofemoral syndrome is best relieved by avoiding the actions that make your symptoms worse, including activities and exercises that involve bending the knees or squatting. Rest, ice, and anti-inflammatory medications might also be recommended. In cases where the kneecap is unstable, the use of tape or a brace may be employed to provide needed stability. The role of physical therapy in treating PFS is to increase flexibility around the knee, improve range of motion, and strengthen the quadriceps muscle. These measures can help alleviate knee pain by reducing stress in the area of the joint. Exercises performed as part of such a routine are typically low force, including stretching and straight-leg raises, and may also involve some weight training. Ice can be applied after completing the exercises, and other methods such as electrical stimulation might also prove useful. The role your biomechanics are playing in your knee pain will also be evaluated and custom orthotics may be prescribed to help correct problems that may be adding to the condition. A good orthotic can help reduce pain by limiting excessive rotation and keeping the kneecap better aligned. If your knee troubles are something you want to forget about, Dr. Jennifer Molner and the staff of Castle Pines Physical Therapy can help. We can expertly diagnose the sources of your pain and tailor a treatment plan around your specific abilities and needs. Schedule an appointment with our Castle Pines, CO office by calling (303) 805-5156.